October Release Blog Hop -- Final Stop! Welcome! Today is Release Day at Technique Junkies, and the Design Team and I are celebrating with a Blog Hop. Hopefully, you arrived here from Kathy's Blog, and enjoyed her beautiful work. If not, please start back at the beginning of the hop, at the Design Team Blog. The artwork is worth every click! 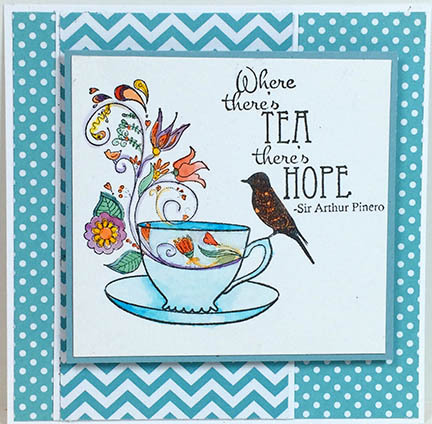 This card was made using the Afternoon Tea Stamp along with the Where There's Tea Sentiment. I used Peerless Watercolors to give a subtle hint of color. If you started at the Design Team Blog, you know that I showed stamps there that were on the masculine side -- this one is decidedly feminine! 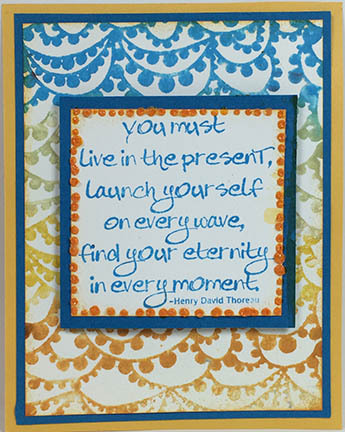 One more for today, using the new Pom Pom Swag Background, with the Live in the Present Stamp used as a focal point. To achieve the color gradation, I simply swiped the background direct to stamp, using 4 colors of Distress Inks. I hope you enjoyed our hop today. Remember to go to the techniquejunkies.com website for the 15% discount!